With the headlines screaming dire warnings about Greece's economic crisis, many travelers have begun to reconsider summer plans to visit the birthplace of democracy due to financial and safety concerns. Having just returned from Greece only six weeks ago, I would encourage you to stop reconsidering and visit Greece as soon as you can! Unfortunately for Greeks but fortunately for visitors, the economic situation primarily affects only the Greeks themselves. Even a Grexit from the Euro and transition to the drachma would favor tourists as the exchange rate promises to be advantageous. Even still, the euro would most likely be accepted after a switch to the drachma as businesses would prefer the stronger currency. Used with the gracious permission of Indiana Jo. In addition, it is unlikely that attractions such as the Parthenon, Temple of Olympian Zeus, and all the museums housing the cultural treasures of the ancient Greeks would close during this crisis, as Greece needs every tourism dollar it can elicit. Just bring enough currency to last your whole trip, be prepared to encounter logistical setbacks more commonly found in third-world countries, and enjoy the falling rates at hotels, especially on the mainland. While the Greek economy has been struggling for years, you wouldn't know it when you visit the islands. Our taxi driver on Santorini spoke of how he moved to the island because of the abundance of well-paying jobs that simply cannot be found on the mainland, and this translates to a pleasant atmosphere for those on vacation. So if you're still leery about visiting the big cities like Athens, consider doing some island hopping and skip all the cities. Bring cash. Even though there are currently no limits on withdrawals from foreign accounts, there's no guarantee that the banks and ATMs won't run out of currency. Credit cards may still be accepted while Greece is officially still using the Euro, but that could change at any moment. Bring any/all medicine you might need. If you are planning to be in Greece for a long visit, make sure you have more than enough of your prescriptions and a supply of over the counter pain relievers, allergy medicines, etc. There have been runs on the pharmacies in Greece to rival the queues at the bank counters. Bring a back-up plan. Is the ferry to Hydra not running due to a fuel shortage? Have a coastal destination on the mainland as a back-up plan to cover a delay until transportation is back in business. Leave your expectations of northern and western Europe behind as you may experience set-backs and delays more likely to be found in developing countries. While ultimately you need to weigh your own pros and cons about visiting Greece during such a tumultuous period, remember that the media loves to disproportionately distort potential problems for a ratings boost. Take the headlines with a grain of salt, and with some careful planning, you could enjoy a budget-friendly experience at some of Greece's most amazing sites! 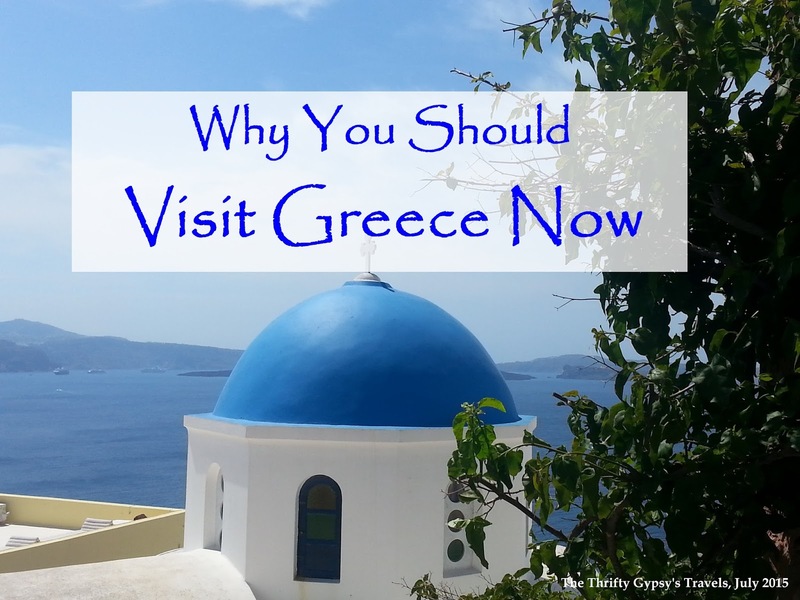 Have you visited Greece lately? Would you go right now if time and opportunity afforded itself? Greece: Time to Cancel or Book? Linking up with Lauren, Van, Isabel, and Marcella. Those are good tips for visiting Greece with what's going on.. if I were giving the option to go there I would definitely do it!